We want to welcome you to our practice and to the Stony Point Dental family! We are devoted to restoring and enhancing the natural beauty of your smile using conservative, state-of-the-art procedures that will result in beautiful, long lasting smiles. We are proud to have served families throughout Rockland County for over 24 years, including the communities of Stony Point, Haverstraw, Garnerville and Tomkins Cove. We appreciate your trust in us. 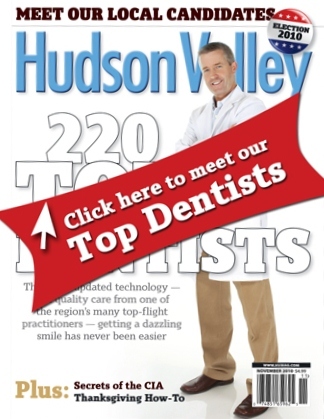 "Top Dentists" by Hudson Valley Magazine for the Tenth consecutive year! Many of our new patients are referred to us by other patients. We sincerely appreciate their expression of confidence, and we strive to be able to earn yours. Our mission is to provide you with the highest level of quality dental care available in a relaxed & friendly environment. Building a foundation of trust by treating our patients as special individuals is the cornerstone of our success. We understand how uneasy some patients may feel about their dental visits, and how we can make a difference in providing a relaxing and positive experience. Our entire team is dedicated to providing you with excellent, personalized care and service to make your visits as comfortable and pleasant as possible. As your dental health professionals, we want you to be confident knowing that we are a team of highly trained and skilled clinicians. We pride ourselves in providing the care you need to keep your smile healthy. To give you the best possible service and results, we are committed to continual education and learning. We attend dental lectures, meetings, and dental conventions to stay informed of new techniques, the latest products, and the newest equipment that a modern dental office can utilize. Also, being members of various professional dental associations helps us to stay abreast of the changes and recommendations for our profession.